Garden Playhouse - Who Has The Best Garden Playhouse? When you have a high quality garden playhouse you not only have a wonderful and safe environment for your children or grandchildren to play in, you also have a building that will enhance the visual appeal of your garden as a whole. It’s a garden building that will be loved by kids and adults alike, so how do you choose which one is best for you? 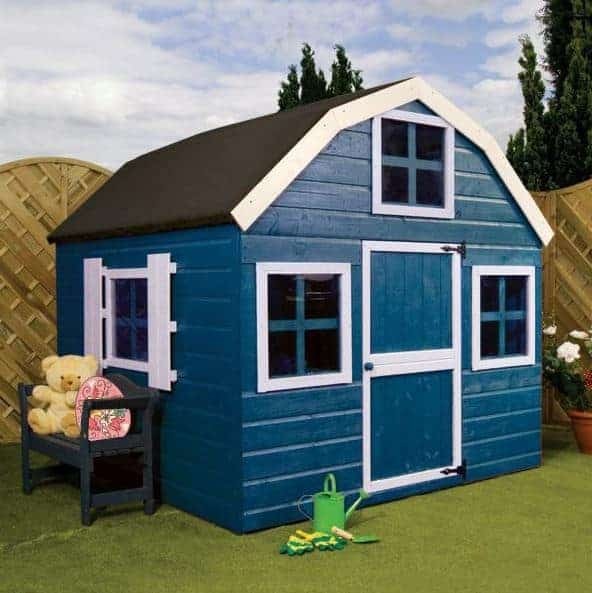 Help is at hand, with our WhatShed garden playhouse guide that can help you find your ideal playhouse. Just below, we’ll reveal the criteria we used to define a garden playhouse, but we were very happy to find fifteen excellent examples to include in our league table. The final positions depended upon a range of factors, including price, value for money, capacity, visual appeal, durability and build quality, and of course that all important fun factor. 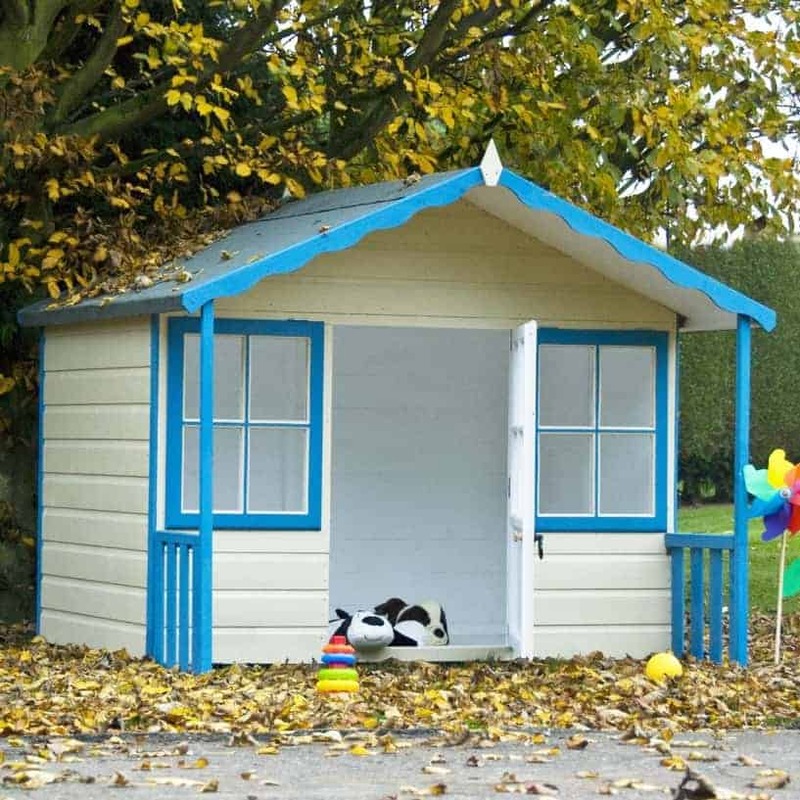 Playhouses come in many different styles and forms, from fabric wigwams to brightly coloured plastic buildings, so what defines a garden playhouse? Our definition is that it’s one that is based upon a traditional garden building, meaning that it not only provides a great play area for children but that it also enhances the visual appeal of the garden. For that reason, they are invariably made of timber, and whilst they may have an upper level, tower playhouses were discounted. That doesn’t mean that they aren’t lots of fun, and after ignoring the claims of many average playhouses out there we were pleased to find fifteen superb models befitting of a place in our league table. 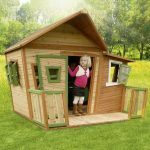 Selecting a champion wasn’t easy, but thanks to its unique design with extended play area, good value price, and very long warranty period, the Dixie Duo playhouse stood out for us as the best garden playhouse that can be bought online in the UK today. 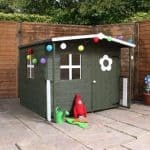 Whether you want a playhouse or a greenhouse, WhatShed’s independent reviews can help you make a great purchasing choice. This garden playhouse looks significantly different to any other than we’ve reviewed, and that’s because it features an integral annexe alongside the main body of the apex roofed playhouse itself. This brings significant advantages in that it provides an extra area for children to play in, and we also liked the original look that it creates. 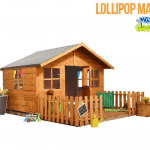 It’s a playhouse that really caught our eye from the moment we saw it, and it’s sure to prove popular with both girls and boys. We were also very impressed by the initial pressure treatment that the manufacturer has used on the timbers, as this is something that we rarely see on a playhouse. This brings a 15 year guarantee against rot, and provides added value to what is a very reasonably priced playhouse. These factors, coupled with the unique design, carry this to the top of our league table. 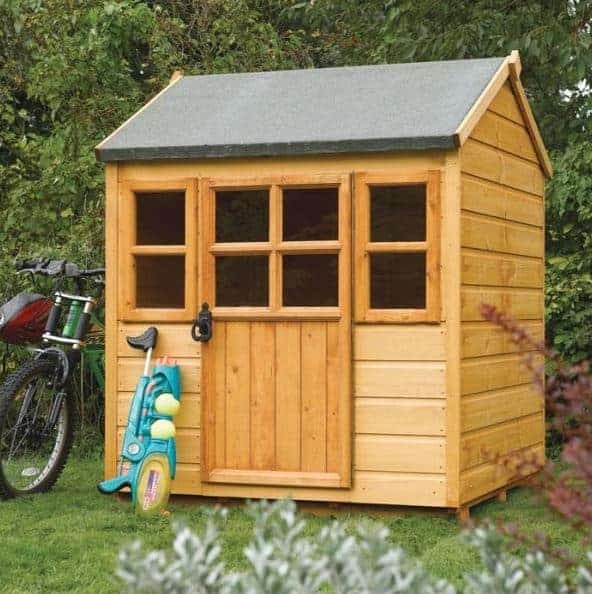 The main body of this garden playhouse has a fun stable style door, and the annexe area has an open frontage making it easy to get in and out. We were pleased to see that it has a pitched roof above it, however, as this quickly carries rainwater away. We also liked the open hatch that connects both parts of this building, which encourages creativity and imaginative play; for example, we can easily imagine children pretending that it’s the counter in a shop or drive through restaurant. Play-Plus take the top two spots in our WhatShed league table, which shows what a reliable and high quality manufacturer of playhouses they are. This runner up garden playhouse, however, is very different to the one before it. It’s a smaller building, without the annexe to add on extra width, but with a base area of more than six foot by four foot there’s still more than enough room for two children to enjoy their playhouse in comfort. It also represents outstanding value for money, when its size and build quality is taken into consideration, at not much more than two hundred pounds, and it’s this that earns it the second spot in our guide. Whilst having a more traditional design, this still caught our eye, primarily because it has a reverse apex. This means that it’s wider than it is deep, making it ideal for use on lawn space that is relatively shallow. Also helping to create an original look that we found visually pleasing is the centrally positioned door, with two square windows on either side of it. This should mean that it’s very well illuminated on a sunny day, which is good news for children who like to use their garden playhouse as a spot to read, paint or colour. Also impressing us was the 10 year warranty, adding even more value for money. 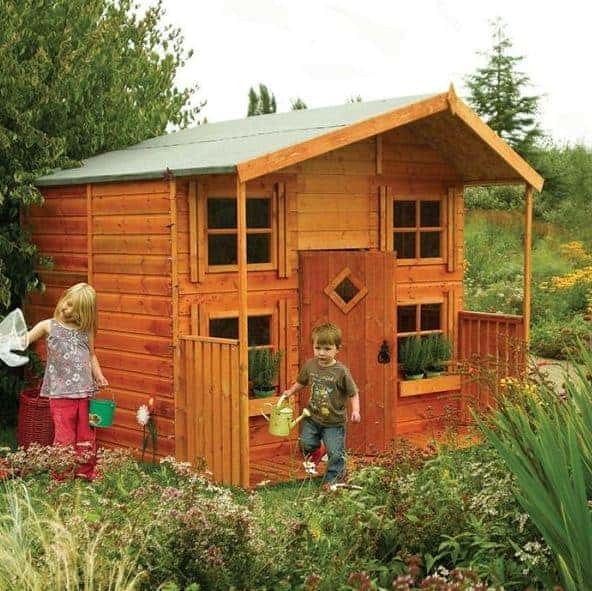 This is a compact garden playhouse, with base dimensions of approximately four foot by four foot and a peak height reached by its apex roof of 1.56m, or just over five foot. This isn’t necessarily a disadvantage, however, as it means that it’s particularly suitable for people who would like to buy a playhouse for their children or grandchildren and yet don’t have a lot of room on which to position one. We also feel it’s a good choice for younger children, and with a very affordable price tag it will make a very good first playhouse. Stylistically, it may be small but we still found this garden playhouse an attractive addition to the garden, thanks to its classic shed like design. Children are sure to love the stable style door, and we were pleased to see not only a window alongside it but also another one on a side panel. With tough and impact resistant styrene glazing used for these windows, you won’t have to worry about them breaking or shattering. 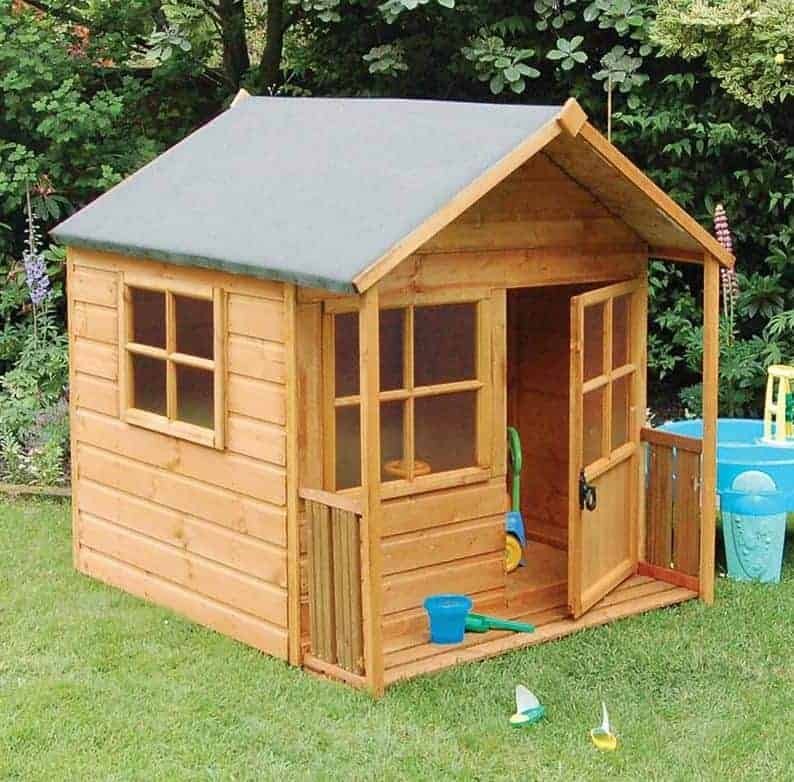 What impressed us most about this playhouse, however, is the 15 year warranty that’s supplied by it as a result of its initial pressure treatment against rot. This also means that the owner won’t have to add coats of wood preserver themselves every year, as we find with the majority of wooden playhouses we review, thus saving both time and money. One of the characteristics of a garden playhouse is that they resemble a traditional garden building used by adults, that’s the case here as well, although it gains an exciting and original look by looking to Europe for its inspiration. This is a playhouse version of a Dutch barn, a classic look that we always like to see, whether it’s used for garden storage purposes or as in this case a great place for children to play in. 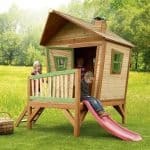 If you want a playhouse that will beautify your garden as a whole, and yet has a classic design as well, then this should certainly be added to your shortlist. The Dutch barn style of this garden playhouse is achieved through the use of a staged five sided roof. This also gives it extra height, which means that there’s enough room for a very useful second layer in which children can play in. With two levels built upon a six foot by six foot base area we also feel this represents reasonable value for money at just a little over three hundred and fifty pounds, especially as it also comes with a 10 year guarantee. We were also impressed with the amount of glazing, with three attractive square windows on the front and one at each side. The side windows have been given extra visual appeal by the inclusion of shutters, which we found to be a nice touch. With a base area of approximately four foot by four foot, this garden playhouse is designed with younger children in mind rather than older kids who will want a little more space. 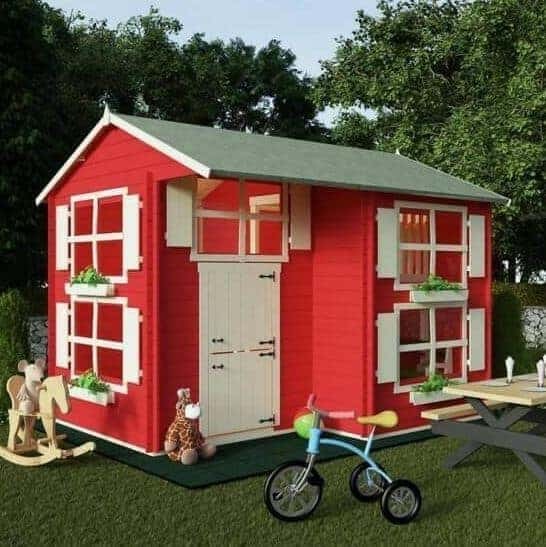 Nevertheless, this will make an ideal choice for parents looking to make their first move into the playhouse market, not least because of its price tag of not much more than a hundred pounds. 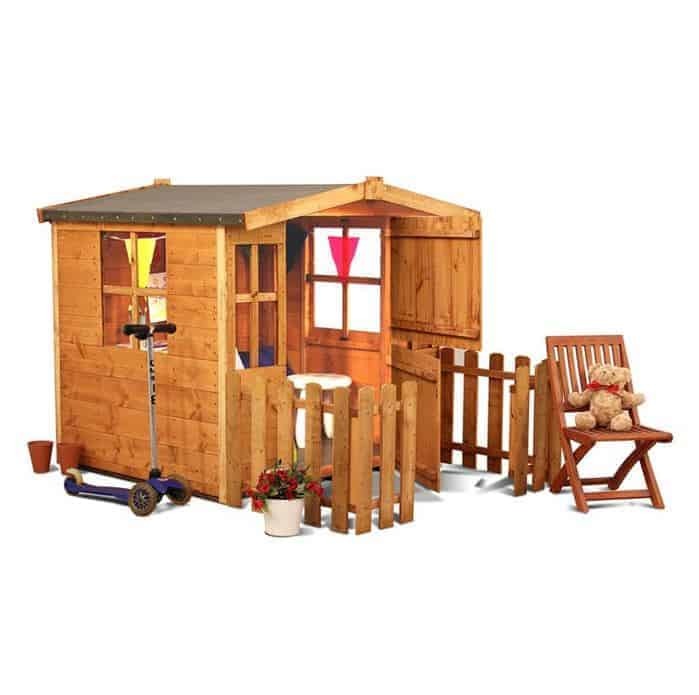 That makes it the cheapest garden playhouse in our top fifteen league table, and yet it comes with a 10 year guarantee and the high build quality that we’ve come to expect from Play-Plus. This superb value for money quite rightly earns it a place inside our top five. In many ways this looks a fairly typical, if compact, garden playhouse, with its apex roof, and one square window alongside a single hinged door. The roof itself, however, is unique in that it is made not of tongue and groove timber or solid sheet material such as OSB, but is actually made from polypropylene. We were impressed by this choice, as it should mean that it is lightweight and easy to manoeuvre, and yet is also very tough and weather resistant. We were also pleased to find that it is UV stabilised, which means that it won’t fade or discolour over time. The first thing that struck us when reviewing this garden playhouse was its reverse apex, meaning that it’s six foot frontage is noticeably greater than its depth of approximately four foot. This makes it a good choice for gardens that may not match the typical narrow and long dimensions that many have. The manufacturer has made the most of this extra width by providing a wide central door, making it easy for children to get in and out even when laden with toys and teddies. There are two square windows on either side of this door, and as well as likely ensuring a plentiful supply of natural light inside they also create a visually pleasing appearance. We were glad to find that the windows can be opened as well, making it easy to ventilate this playhouse on a hot day. The other thing that stood out for us with this garden playhouse was the extended canopy formed by an overhanging apex roof. This creates a highly useful shaded area, meaning that children can take in fresh air outside of the playhouse itself and yet still be protected from the sun’s rays; it also comes in very useful when it’s raining of course. Once again a 10 year warranty is included, which is something we always welcome, adding to the already good value this aesthetically pleasing playhouse offers. Even though this garden playhouse bears the name of ‘little lodge’, at nearly five foot by four foot it’s not the smallest that we’ve seen, and so there’s easily enough room for two young children. With that in mind, and also taking into account it’s good built quality, attractive design, and 10 year anti-rot guarantee, we feel that it’s asking price of significantly less than two hundred pounds represents excellent value for money. The combination of these winning attributes is enough to carry it into the top half of our WhatShed league table. The first thing that caught our eye when we saw this garden playhouse, is that the reverse apex frontage is glazed from one side to the other. This glazing, of course, is styrene and is one reason why this playhouse, like all the others on our list, meets the relevant European safety standards. The amount of glazing should provide a lot of light inside this playhouse, but it also means that children can easily see out and parents or grandparents can easily see in, which is reassuring for both parties. We were also impressed with the use of 12mm thick tongue and groove cladding for the walls, which should make the playhouse seem strong and stable once assembled, and giving a smooth exterior that’s pleasing on the eye. Larger than their little lodge, and with a traditional reverse apex, this garden playhouse from Rowlinson may suit slightly older children than their little lodge playhouse we just looked at. 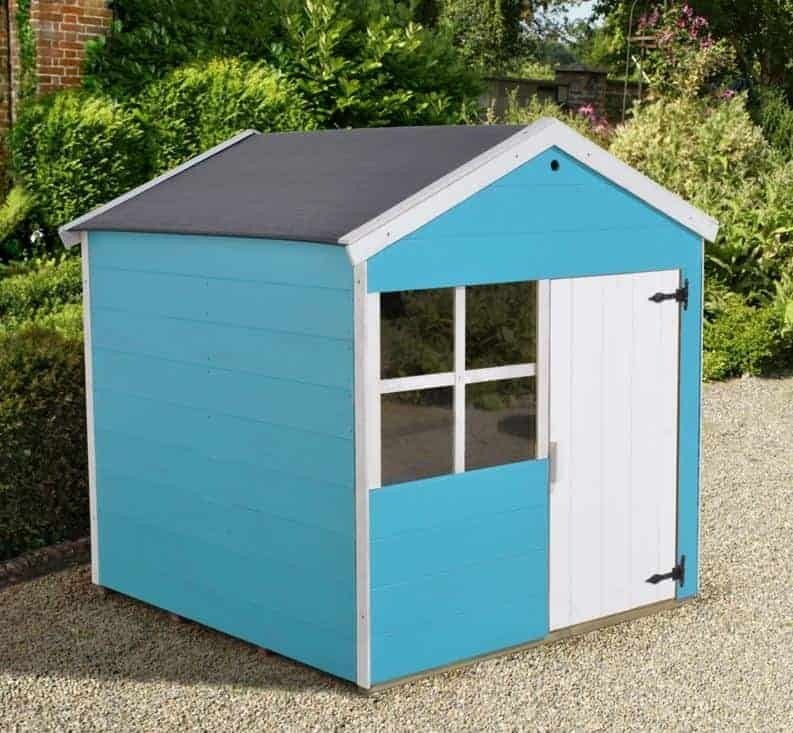 Whilst we still feel that this offers good value for money at just under three hundred pounds, especially as it too comes with a 10 year manufacturer’s guarantee, the price is significantly higher than their little lodge, and that explains their relative positions within our league table. 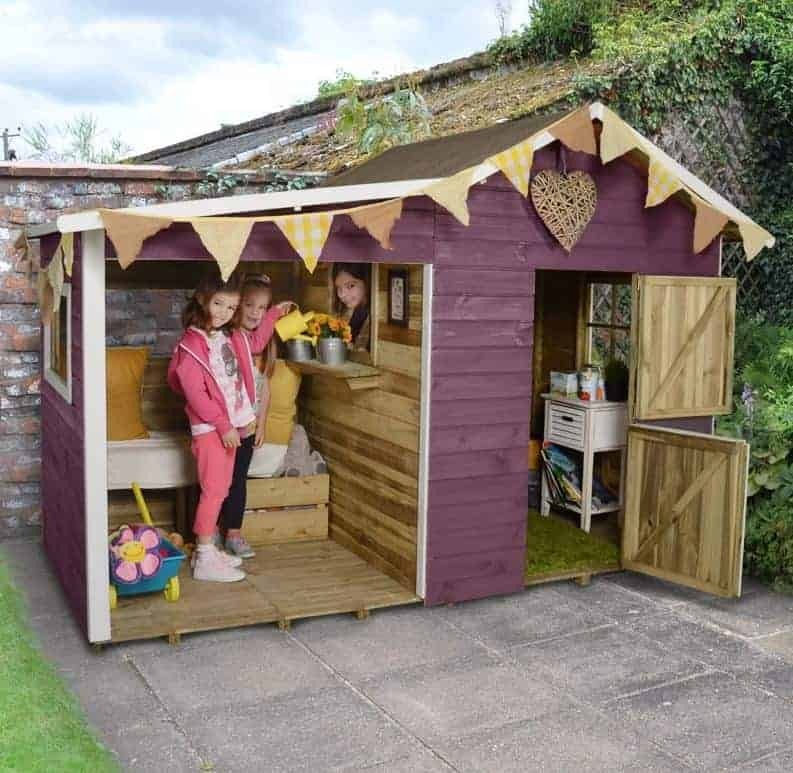 One feature that we particularly liked about this five foot by five foot garden playhouse is the wooden verandah at the front protected by the slight overhang of the roof; this provides extra weather protection for the playhouse, and for the little ones who are using it. We also liked the antique style brass handle on the door, which is just one reason why this is one of the most traditional looking wooden playhouses that we’ve reviewed. 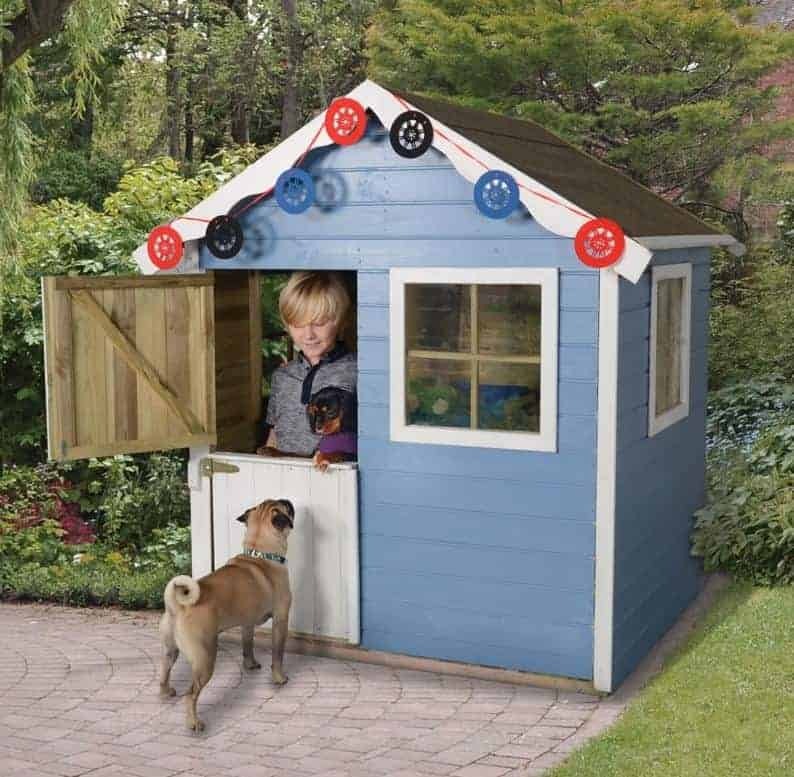 If you already have good looking and classically styled garden buildings on your lawn, then this playhouse should fit right in. It should also have one of the lightest interiors that we’ve found on a children’s playhouse, thanks to a large window on the front, another on a side panel, and the half glazed single hinged door. 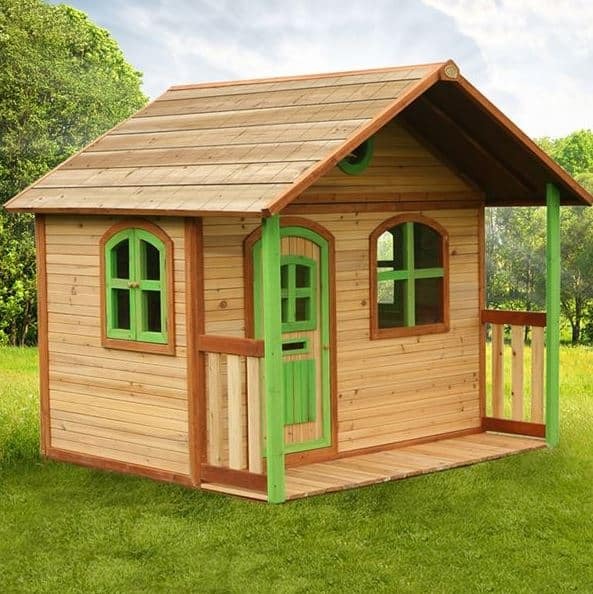 This four foot by four foot garden playhouse has an apex roof in common with most examples of the genre that we see, but in this case it is much shallower than usual, giving a peak height of 1.18m, or 3’10. This can be a boost to privacy, as it means that the playhouse can easily be hidden away behind a fence or a wall, and it should still have enough height and space for most young children to enjoy. This then is a garden playhouse which we feel would be ideal for the younger end of the market, by which we mean children aged between three and five. With the addition of a vibrant colour scheme it can be transformed into something that will be very exciting to young eyes, and the relatively low profile also made it look visually striking to us, especially with its integral picket fence. We’ve reviewed lots of BillyOh garden buildings, in all shapes and sizes, and we were pleased to see that this one follows their pattern of providing good looking buildings made with high quality components at a very good value price. We would have liked to see a 10 year warranty against rot provided, however, but the five year warranty supplied here is still more generous than we see on many timber playhouses. 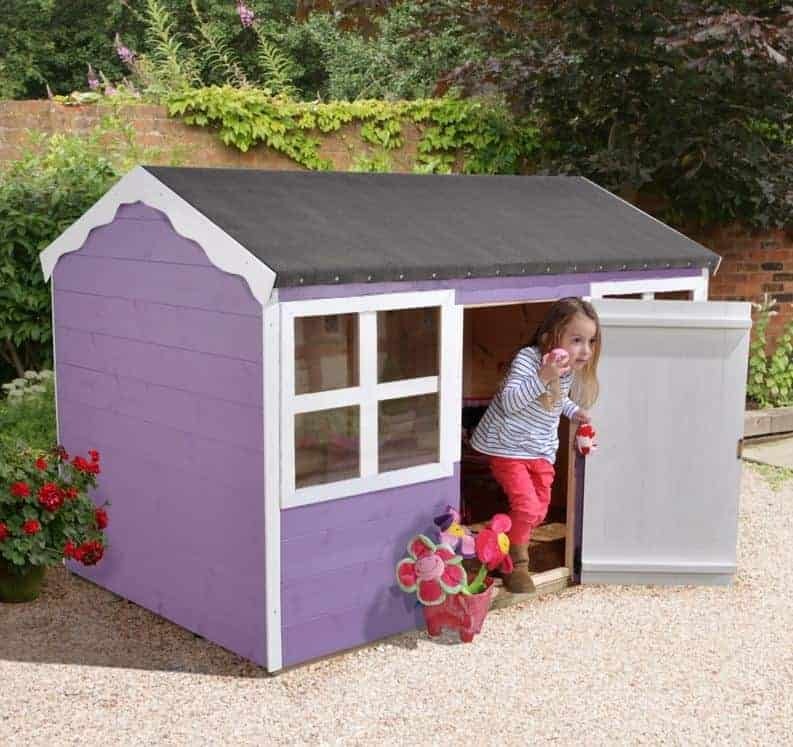 This is the second largest garden playhouse to feature in our top fifteen list, and that makes it ideal for slightly older children and for those who like to share their playhouse with siblings and friends. Play is even more fun when spent in the company of others, of course, and it also helps with the development of essential social skills. With this extended play area, however, comes a heightened asking price of over six hundred pounds, and this is the reason that it hasn’t achieved a loftier position despite having many qualities and features that we were very impressed by. From the moment we saw it, we found this a visually stunning garden playhouse, but we’re confident that it will appeal to younger eyes too. The first thing that caught our attention was the veranda with railings and the roof canopy. We also found the four cross hatched square windows highly attractive, and the glazed diamond shaped panel in the centrally positioned door is a nice touch. 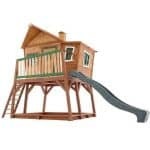 There’s an upstairs platform, reachable by an internal ladder, that presents even more play opportunities as well, so whilst this may not be the cheapest playhouse we’ve reviewed it’s one that’s sure to bring a smile to the faces of your children or grandchildren. This six foot by six foot Milan model is as close to a contemporary look as a garden playhouse gets, but that certainly doesn’t detract from its appeal for either adults or children. The basic design follows the apex roof tradition, adding extra space and extra value courtesy of a slight veranda and overhanging canopy. Where it gains its original look, however, is in its door and windows. The door has a glazed upper section, and there are also two larger windows, and all of them have a curved top. There’s also a round porthole just underneath the ridge of the apex roof. This gives a very striking appearance, and one that’s very original as well, which is something that we always prize highly. There are two other decorative flourishes that impressed us on this garden playhouse. The side window opens outwards from the centre, in a shutter style, and the door has a letterbox on it which can be a great aide to imaginative play. If good looks and originality are two of the most important things you look for in a playhouse, then this should be near the top of your play list. It is a little more expensive than many other mid sized playhouses we’ve reviewed though, and this is why it is in the lower rather than upper half of our league table. This is easily the largest garden playhouse in our league table, with two storeys taking up a base area of more than ten foot by eight foot. 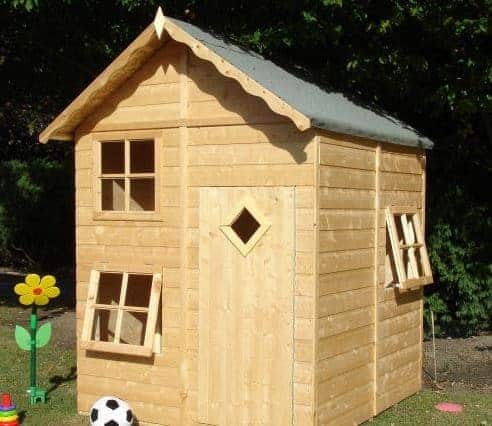 It’s also the most expensive playhouse in our league table, with an asking price that’s just short of a thousand pounds. Both of these factors have been given due consideration when determining its final position within our guide, but if you want a large playhouse and have a budget that encompasses this price tag then you may want to give it your primary consideration. This is not only a very large garden playhouse, relatively speaking, it should also be a very strong one. That’s because it uses 19mm tongue and groove cladding. The interlocking boards are significantly thicker than the 12mm cladding that we usually see, even on other high quality models, and this makes it sturdier and more reliable in windy conditions. This is helped even further by the addition of strengthening chalet connectors, which is something we usually only find on full sized log cabins. This also gives the playhouse a very attractive look, especially with its shuttered windows and stable style door. If this had been a little cheaper, and if it had boasted a 10 rather than 5 year warranty period against rot, then this could have found itself challenging towards the very top of our league table. Once again we have a garden playhouse that makes the most of its traditional garden building design, but this one immediately caught our eye as it’s significantly taller than we usually see. The peak height at the top of the apex roof is 2.35m, or 7’9. This is twice as tall as many playhouse that we’ve reviewed, and that means that it can comfortably encompass a second level. This is something we were very glad to see, as it not only means that it can be used by more children at any one time without becoming too chaotic or too crowded, it also encourages the use of creative and imaginative play. In a child’s mind we can easily picture the upper platform being transformed into the balcony on a fairytale castle, or the look out point at the head of a battle. There are three windows on this garden playhouse, and we were pleased to find that two of them can be opened, preventing the interior from becoming too warm on a summer day. One other thing we particularly liked was that it is supplied part made in a modular form. 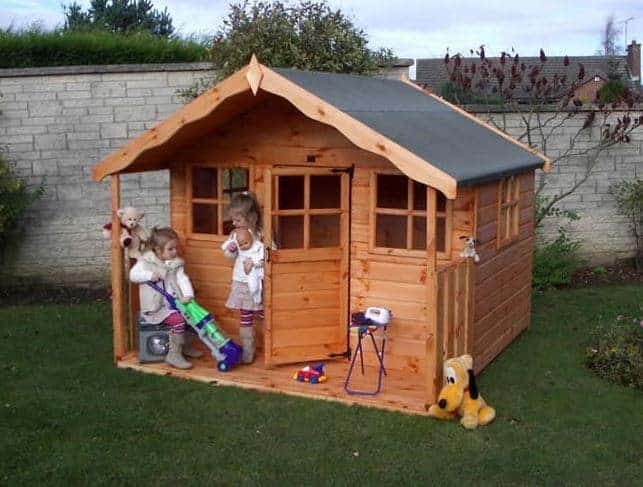 This means that it should be much quicker and easier to assemble than many playhouses we review, and so is suitable even for those who have never installed a garden building before. With so much to recommend it, only the lack of an extended warranty period keeps it towards the foot of our league table. This garden playhouse has a look that’s very different to any other model to gain a position within our WhatShed league table, and so it’s a good choice if you like to have unique garden buildings that can become a talking point with your neighbours and friends. The first unique feature of it is that it’s the only playhouse here to make use of a pent rather than apex roof. The pitch still carries rainwater quickly away, but it makes the building as whole stand out more from the moment we saw it. We were particularly taken by the row of tiny windows just underneath the high point of the roof, and it should mean that the inside seems very bright and welcoming on a sunny day, especially as there are also other windows on either side of the building. 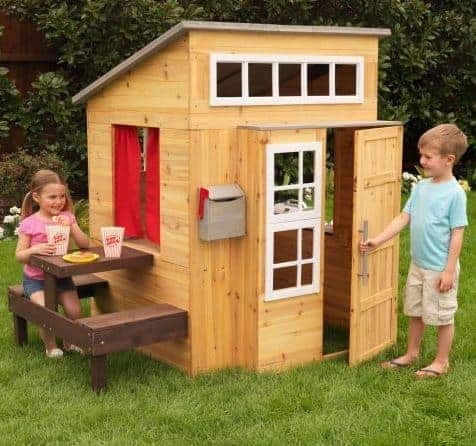 The second unique feature of this six foot by four foot garden playhouse is that it has a strong and sturdy picnic table attached to one wall. We all know how much kids love picnics, and this makes a great location for one whether sharing treats with their friends or their teddy bears and dolls. At just over three hundred pounds we feel this represents good value for money, although that is let down somewhat by the absence of an extended warranty against rot. Shedlands are renowned for the strength, durability and quality of their garden buildings, as well as their traditional designs, so we were pleased to see that their seven foot by five foot garden playhouse encompassed all of these points. The 12mm redwood tongue and groove cladding is smooth planed and attractive, meaning that it will catch the eye even before you paint it in your children’s favourite colours. We were also impressed by the 44 x 27mm frame, as this is much thicker than we’re used to seeing on playhouses. For that reason we feel that this playhouse could be a smart choice if you live in an exposed area that’s often subject to strong winds. Another thing that particularly impressed us about this garden playhouse is that it comes with lots of options available to the customer. For example, a two foot veranda can be added to give an outdoor as well as indoor play area. It’s also possible to upgrade both the wall cladding and the floor to a very thick and strong 22mm timber. All of these options, and more, add to the initial price of course, and its already higher than average asking price and lack of an extended warranty ensure that it remains in the final position within our league table. This is a brilliant site! I really just wish companies would ‘sack’ delivery charges to the North of Scotland – maybe you should do a best 10 for no delivery charges to the North of Scotland! 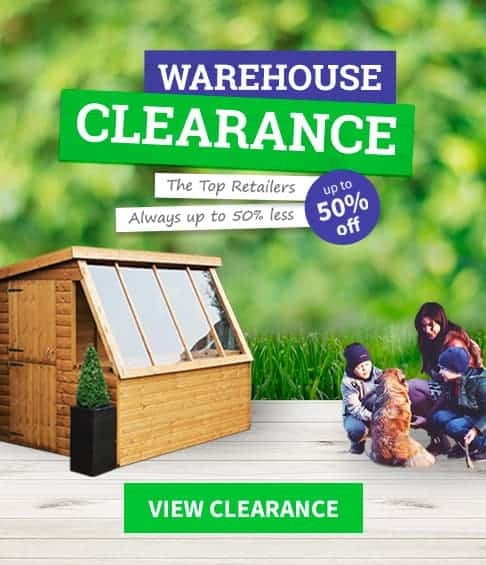 I for one would be interested as Ive just spent 1.5 hours searching for a playhouse/adventure hut for my 6 year old only to be faced with 49.99 delivery charges!! Even with ‘free delivery’ ‘offers’ Just a joke! We are launching a local directory of garden building retailers very soon. This will have a section that covers all of North Scotland.